Lyle Stewart was born and raised near Pense, Saskatchewan, where he continues to farm and ranch with his wife Linda and son Lee. Lyle was one of the first members in the newly formed Saskatchewan Party and was elected to the Legislative Assembly as the MLA for Thunder Creek in 1999. 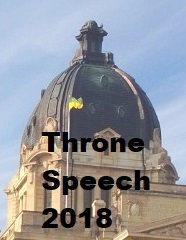 After the Saskatchewan Party formed the government in 2007, Lyle served as the Minister for Enterprise and Innovation, the chair of the Legislature’s Standing Policy Committee on the Economy, a member of the caucus' Standing Policy Committee on the Economy, and the Province’s Treasury Board. On May 25, 2012, Premier Brad Wall appointed Lyle as the Minister of Agriculture and minister responsible for Saskatchewan Crop Insurance Corporation. Lyle and his wife Linda have three grown children and six grandchildren.